Rio de Janeiro possesses the necessary infrastructure for operating any kind of initiative and Rio Negócios has the necessary knowledge to help you use that structure in favor of your investment. BNDES data project US$ 448 billion in infrastructure investments until 2016. The port of Rio has the capacity to move 5,5 million tons and presented an average growth of 20% in volume of passengers over the past few years. The Porto Maravilha project is already in progress, promoting a complete revitalization of the harbor and the surrounding region. Santos Dumont Airport, with strategic location, near the City Center. Through both airports combined, went in 2011 the equivalent of four times the city’s population. Beyond the harbor and its airports, the city is well equipped by roads that enable integration with the rest of Rio de Janeiro state and other states in Brazil. Internally, the Rio de Janeiro road network is receiving investments of US$ 7,8 billion to amplify and integrate public transportation. 47,9 landline telephone points for every 100 inhabitants, compared to the national average of 21,6. 3 of the top 4 mobile telephone operators in the country have their headquarters in Rio de Janeiro (Vivo, TIM and Oi). 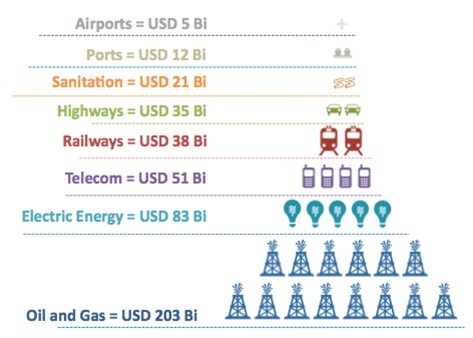 Over 770.000 clients of channeled gas, consuming over 48 million m3 in 2011. There are over 30 heliports in the city. Wide distribution network with over 2,6 consumer units. Over 75% of sewage volume produced is treated. In Brazil, the average is 39%. The program to install UPPs (Pacifier Police Units) that is occupying areas formerly controlled by drug traffickers. Over 35 UPPs are operational. Over 6.800 industrial establishments operating in the city.